A small set of textures for the free Marshmallow Animals from RuntimeDNA. There are two textures for the Bunny (pink and purple) and one for the Chicken (yellow). This is a quick freebie and I hope you can enjoy it. 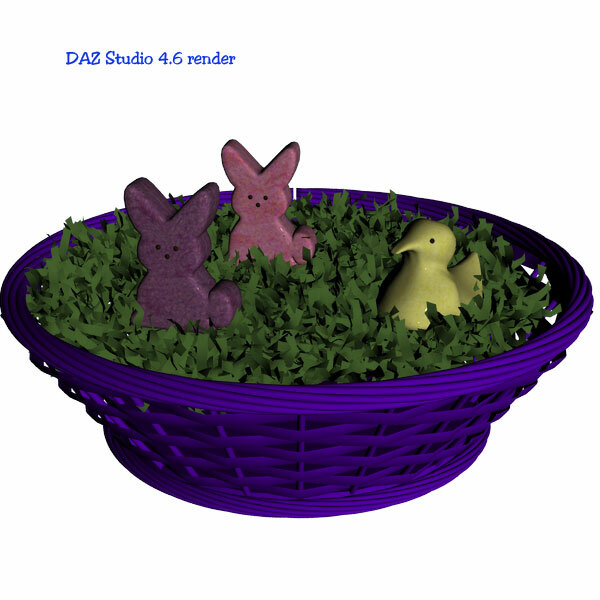 There are material files for both DAZ Studio 4.6 (.DUF files) and Poser (.MC6 files). Just textures to make the Marshmallow Animals look like Peeps. The free Marshmallow Animals found at RuntimeDNA in the free stuff section here: http://www.runtimedna.com/Free-3D-Marshmallow-Animals.html These textures are only for the Bunny and the Chicken. This product has texture files and bump map files in the Runtime Textures folder, so any software that can use them will work.